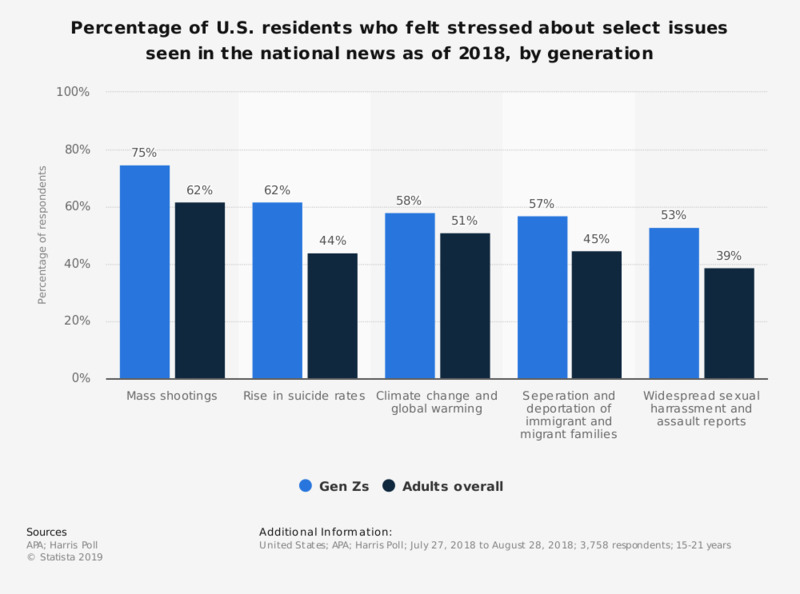 This statistic depicts the percentage of U.S. Generation Z respondents compared to adults overall that felt stressed about select issues they have seen in the national news as of 2018. According to the data, 75 percent of Gen. Z respondents felt stressed about mass shootings in the U.S. Comparatively, just 62 percent of adults overall stated that they were stressed about mass shootings in the U.S.
For the purposes of this survey, generations are grouped as follows: Gen Zs (15–21), Millennials (22–39 years old), Gen Xers (40–53 years old), Baby Boomers (54–72 years old) and Matures or older adults (age 73 or older). When “Gen Zs” is used, it refers to the overall group (ages 15–21), unless otherwise specified (e.g., Gen Z adults meaning 18-21 or Gen Z teens, 15-17 only). Please note: where descriptions refer to Gen Z adults this means that questions were not asked of the 15-17 age group so no comparative data for that age group exists.